I was in the mood for something bright and crisp! I recently came across a card that I adored that used the Flower Patch Stamp Set without the coordinating Flower Fair Framelits and a light bulb went on over my head. Then I saw this sketch and the card came together pretty quickly from there! I love the combination here of Crisp Cantaloupe and Calypso Coral for my flower. So bright and cheerful! I stamped the flower center in Calypso Coral as well and then added some Wink of Stella for a touch of sparkle. I used Crisp Cantaloupe, Pink Pirouette, and Soft Sky for the background flowers. I also liberally applied Wink of Stella to them as well, unfortunately the sparkle doesn't photograph well.. The details...I frayed the ends of my Twine to add extra dimension to the card and applied sequins liberally :) I couldn't resist the stitching detail on the tag. It's the 'Anytime Tags" Die from Lil Inker. I was excited today to use products from the Patio Party Suite that I was able to earn for free during Sale-a-bration. Even the cardstock color is new! It is one of the new 2012-14 In Colors Raspberry Ripple and I have to say it is a truly stunning color! The blue on the card is another of the new In-Colors Midnight Muse. These new In Colors have such a deep vibrancy to them. So yummy! When I put this card together I decided to follow the sketch exactly and my vision was for a crisp card that could be used for a masculine birthday. I also broke out the new Itty Bitty Banners stamp set and the new Bitty Banners Framelits. The image stamped perfectly with my new foam pads and the framelits were a dream to use. I was worried that the framelits might wiggle when going through the Big Shot and that my image would be askew, but I had no trouble at all. Easy Peasy! (Sorry, I couldn't restrain myself). 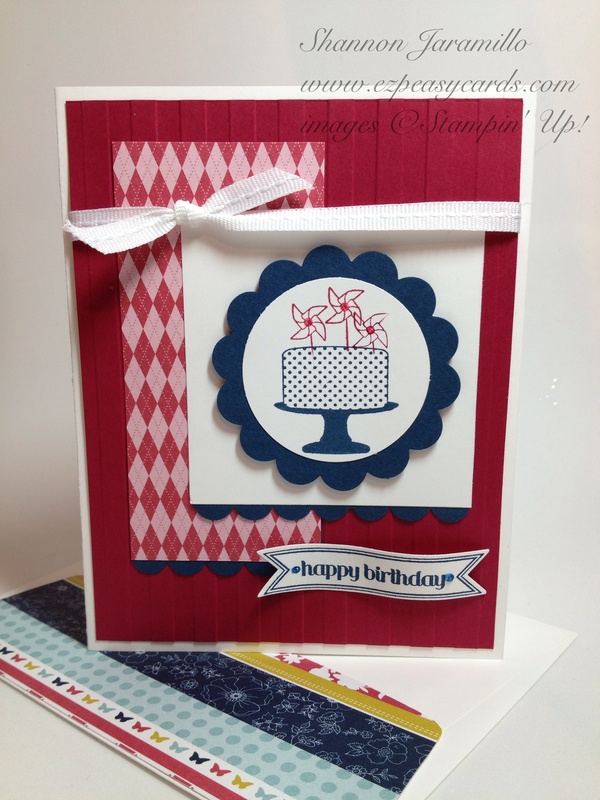 I had fun with this sketch and am pleased with how the card turned out...just gotta love all the coordinating products! Please pop over and see other cards created with this sketch at Mojo Monday - The Blog.